Due to the highly fragmented nature of the global regulatory affairs outsourcing market, only a handful of large players have been able to gain significant share in this market over the past couple of years, says a new report by Transparency Market Research (TMR). This, however, has intensified the competitive rivalry in the market with players contending to deliver top-notch services. The top seven players in the market including Quintiles Transnational Holdings Inc., ICON plc, Pharmaceutical Product Development LLC, and PAREXEL International Corporation collectively held a share of 55% in the global market in 2014. The presence of a large number of small and medium-sized companies in the market has been advantageous to the bargaining power of clients. The scenario demands regulatory affairs outsourcing service providers to top in terms of timeliness and quality. With increasing acceptance of electronics submissions from health governing bodies and compliance agencies, technological advancements will favor regulatory affairs outsourcing service providers to gain competitive edge, says the TMR report. 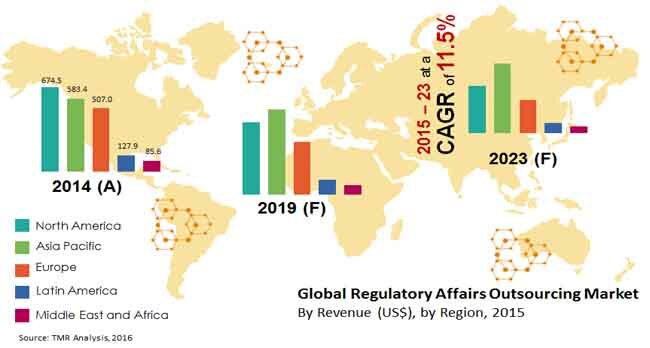 The global market for regulatory affairs outsourcing was worth US$1.9 bn in 2014 and is projected to rise at a CAGR of 11.5% between 2015 and 2023. As such, the market will reach a valuation of US$5.7 bn by 2023. With the medical industry witnessing an increased rate of product innovations from companies vying to make a mark in the highly competitive market, investments on research and development are on the rise. In this regard, cost pressures and intense competition are pushing companies to discover new ways to contain costs incurred at the time of regulatory operations and practices principal to the life sciences industry. Outsourcing is increasingly being preferred over in-house data management as it is considered to be cost-effective and resource-efficient way of managing vast amounts of data generated during clinical trials, approvals, and patent approvals. Moreover, strict regulatory framework in place that governs every facet of development and marketing of medical drugs and device mandate that regulatory documents to be in sync with pre-defined writing guidelines. This is further boosting the need for professional service providers that specialize in data handling related to regulatory affairs thereby further augmenting the need of dependable service providers for regulatory affairs outsourcing. With life sciences companies continually striving to spread their wings across the globe, the challenges of keeping up with varied and constantly changing regional, local, and national regulations can be overwhelming without expert help. In this scenario, outsourcing regulatory affairs to service providers that have a successful global footprint will be most suitable. On a regional consideration, regulatory affairs service providers in the emerging economies of Asia Pacific and Latin America are expected to account for the leading number of outsourcing projects worldwide. An increasing number of biopharmaceutical companies are taking off from emerging economies to venture into large markets of North America and Europe. Product improvement and setting up research and commercialization units is the focus of emerging economies due to cheap resources and cheap cost of raw materials. The large population of Asia Pacific makes for a lucrative regional market for the medical industry. These factors are benefitting the regulatory affairs outsourcing markets in these regions and will help them gain a strong foothold in the next few years.